Another Beautiful Day in Paradise. We had fairly clear skies, temperatures in the 80's and a little breeze out of the SE. 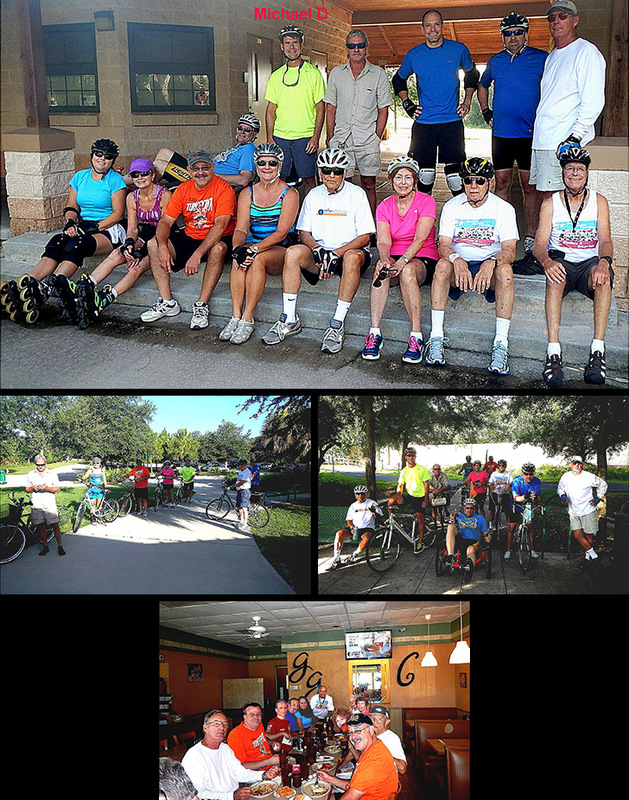 Bladers/Bicyclers Rick S, Michael D (new bicycler), Andrew F, Rob G, Ken T, Roy H, Vivian A, Sandy R, Rob H, Janice H, Steve G, Nancy & Bob L and Bruce M made the group picture. Cindy S and Charles C missed the group picture. Welcome all. We ended up in 3 groups. One group did 10 miles. One group did 12 miles, One group did the whole trail for 14 miles. We had 5 Bladers and 11 Bicyclers. We Brunched at the Garden Grille as planned. I called ahead and they reserved one big table for us all. The food and service were good and the coffee flowed freely. Rob rated the food a 9.5.